By NASA astronaut and DRATS crew member Scott Tingle. Picture to the left shows Astronaut Scott Tingle performing an Extravehicular Activity (EVA) during DRATS 2011 testing. Here we are at Test Day 8 of Desert RATS! Crew A is currently executing their last day of extravehicular activities (EVA). They are exploring the quarry (aka the Pit) and accumulating samples of the Black Point Lava Flow area. Crew B is spending their last day in the Deep Space Habitat. They are completing several maintenance, support and science tasks. I got to tear down, clean, inspect and reassemble a differential from one of our space exploration vehicles (SEV). I liked the procedure, and it gave me a chance to get my hands dirty! Carolyn and Megan have been analyzing several samples obtained from the Hot Dog Hill area during the past couple of days. Jake has been pressing hard to reach out to several schools, and has had great discussions with hundreds of America’s future and current engineers, scientists, technicians and operators. Operations have been getting stronger and more efficient every day. The team, to include the crew, mission control, science backroom, engineering, technicians, safety and operations, has been getting stronger minute-by-minute. Watching this process has been the most rewarding aspect of this event for me. Another exciting aspect of this test is the many educational and outreach events the team has completed. We have been talking to high schools, elementary schools, NASA Visitor Centers and local tours. All of the outreach events provided opportunities for audience members to ask questions. We’ve had hundreds of great questions and discussion points. The entire team has supported these events. Our audiences have had the opportunity to interact with engineers, technicians, managers and crew. A few outreach events remain for Thursday and Friday, and then Media Day on Monday. You can review recordings of these events on Ustream, or see pictures on Flickr. Take a look at the NASA Desert Rats web page, Facebook page or Twitter to get more information and links to hundreds of pictures and videos. Thanks to all for your support of Desert RATS! One of the great advantages to sending humans to explore other Solar System bodies is the chance to document, collect, and analyze scientific samples. Here at Desert RATS we primarily focus on the collection of geologic samples, or rocks and soils. Although these samples can be studied in the Deep Space Habitat (DSH) Geolab, or back on Earth, it is extremely critical to document the context in which the samples are collected so that the science team can use those samples to piece together a geologic history for the area. The hammer, shovel, and tongs enable us to break off a piece of local rock or scoop up a sample of soil. However, prior to doing so we use cameras that are mounted on our backpacks to show the intended sample in its undisturbed location, preferably with the hammer or shovel in the picture to provide a sense of scale, or the size of the rocks. Once we pick up the rock or soil sample we describe its color, texture, size, and general makeup as well as any other important observations. This information helps the science backroom determine what type of sample it is. After collecting the sample we take a picture showing the sample along with its sample bag, with the number clearly visible. This enables us to keep track of what samples go in what bags. We also acquire an image showing the sample’s location once the sample has been collected to provide further context of the environment in which the sample was located. After an EVA is complete and we have returned to our Space Exploration Vehicle (SEV) we place all the samples on the aft deck (back end) of the rover and take one last photo. This helps the science team keep track of which samples were collected on which EVAs, because with so many samples being collected it just takes one computer error or malfunction to lose track of your samples. This picture provides another piece of data to help us keep track of that information. We weight all of the samples in their storage locker and then place them into what we call the sample mailbox on the aft deck. 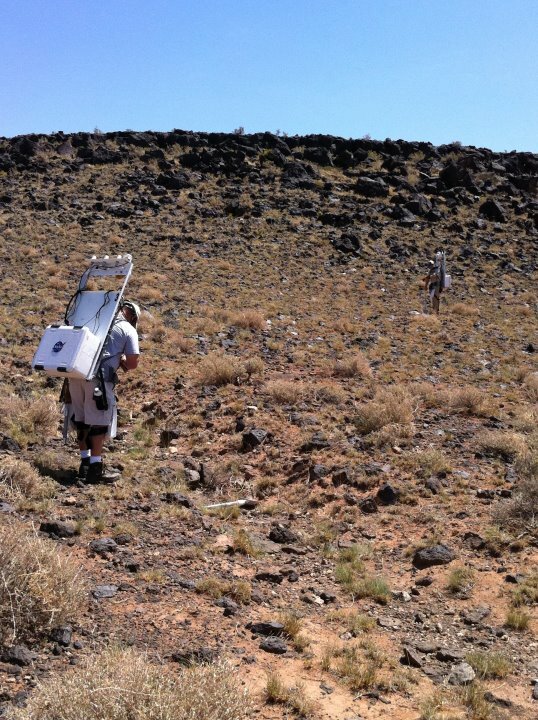 This is our standard way of collecting geologic samples during Desert RATS. However, just like during the Apollo Missions, we also have what we call “special samples” that are collected in a slightly different way. This year we have two science instrument teams involved in the test. I am involved with one of these instruments, called Volatile Analysis by Pyrolysis of Regolith (VAPoR). This instrument has the potential to “sniff” out water or other volatiles that we might use to help survive on another planet. It can also help identify bio-signatures, or signs of past or present life. However, one problem with collecting our samples is that we ourselves create a bio-signature and are composed of water. So our standard sample collection protocols can potentially contaminate a sample to the point that the instrument cannot identify minor traces of what it is looking for. As such, this year we have incorporated a new “special” sample collection protocol for VAPoR samples. Once a crewmember or the backroom identifies a possible VAPoR sample we are careful to not touch it with our gloves. We also never let the sample touch the bags. So we basically encase the sample in aluminum foil to isolate it from interactions with the gloves or bags. This is a first step for Desert RATS to incorporate new science instruments that are in development at different NASA Centers, and to begin thinking about the steps necessary to collect samples in a non-traditional way. Booyah from Desert Rats! We finished week 1 of the test and are enthusiastically moving into the final stages. Crew A completed countless test events and not only survived, but thrived living in the Deep Space Habitat for 4 days and 3 nights straight. They optimized work space usage, streamlined processes and experienced much camaraderie. Today (Monday), Crew A begins a series of EVA test events that will help the community flush out performance characteristics of several operational configurations designed to optimize exploration of deep space locations. Crew B completed several EVA test events and has commenced a 4 day and 3 night test living in the Deep Space Habitat. Today, Crew A will complete several maintenance tasks designed to evaluate the Habitat for functionality and effectiveness. The EVA tests have been going fairly smoothly. As with any complex operation, we have demonstrated the importance of timely and concise communications. The 50 second delay in communications between earth and our deep space location can make operations extremely challenging. It has been rewarding to watch the team realize and overcome this challenge as every test event seems to progress more smoothly than the previous event. The same applies for the processes being completed during our evaluation of the Habitat. And you’ll be happy to know that our plants inside the habitat are growing like crazy! I’m responsible for putting together the team of scientists that will be working with the crew in the field when they are doing science activities at Black Point. I was originally trained as a geologist, but after more than 20 years in the space program, I’ve developed a specialty in defining and executing field science operations – the actual activities a scientist would do outside of a laboratory to understand and explore a particular location. I’ve been fortunate to work at the South Pole, several hundred miles from the North Pole, on volcanoes, in the Grand Canyon, and in everything from a helicopter to a space suit. After graduating from Governor Livingston High School in New Jersey in 1970, I went to St. Lawrence University in Canton, New York in 1974. I received a Masters Degree from the University of New Mexico in Albuquerque in 1976 and after a stint in the U.S. Army, I attended Arizona State University in Tempe, Arizona, where I received a Ph.D. in 1984. I have been working in the Space Program since 1990, when I moved to Houston as an employee of Science Applications International Corporation. My Desert RATS history goes back to 1997, when Mr. Joe Kosmo and I were part of the first Desert RATS team that went to Death Valley to do ergonomic studies of what geologists do in the field. On that first venture, and almost 10 years of subsequent RATS trips, I was the test subject while Dr. Sudhakar Rajulu, a biomechanics expert, did motion studies of my activities as a did a variety of geologic investigations. In 1998, I “graduated” to doing space suited activities, and for the next 8 years, I was the principal space suit test subject on our almost yearly excursions to Arizona and California. In 2007, I moved up to the science management area, and in 2009, I was hired by NASA, in part to build on my experience on the previous Desert RATS exercises to expand the science support part of the test. Last year, we tested a 14-day lunar exploration mission, with a full science team supporting the operation…now, what that means in simple terms is that when an astronaut is out on a planet’s surface, doing scientific exploration, there is a wide variety of people supporting them. Some of these folks are from Johnson Space Center’s Mission Operations Directorate and they are concerned with things like the astronaut’s health and safety, the timeline of the day’s operation, and what to do in an emergency. Our science team last year was responsible for paying attention to the scientific part of the mission – what do we want to accomplish scientifically, how is the crew doing it, do they need any scientific expertise to supplement their considerable talents, and are we seeing significant discoveries that we need to pay close attention to? To accomplish that, we had approximately 10 scientists sitting in the science mission control 8-12 hours a day, in effect watching over the shoulders of the crew and helping them do their job in the field. An important part of what we’re doing is testing – trying out new ideas for things no one has done before, seeing what works, discarding what doesn’t and improving what did. Although NASA has been working on space exploration for 50 years now, there’s still a lot we don’t know how to do, and that we have to learn. The most important part of this business is ideas – thinking of new ones, and testing them so we know what works, and equally important, what doesn’t. That’s all I have for today…I’ll be posting more details in the next couple of days about what we’re doing, and what we’re learning. Desert RATS..What is a “science backroom”? During the Apollo program, the astronauts had to learn a lot of geology in order to work on the lunar surface. The scientists who trained the astronauts wanted to remain involved in the mission and so they formed the first “science backroom,” a special room downstairs in the mission control building where they could monitor the astronauts on the lunar surface and communicate with them through Mission Control if they saw something they wanted to bring to the crew’s attention. The Apollo science backrooms contained little more than a single black and white TV and a telephone to call Mission Control. Now scientists are used to interacting with data in real time and using that data to plan the next day’s science activities, like the Mars rover science teams. The Desert-RATS science team takes the best “lessons learned” from Apollo and robotic spacecraft operations and combines them. Our Desert RATS science backroom is also in a room downstairs in Mission Control (we are across the hall from the ISS control room! ), but unlike the Apollo backroom, we are operating with access to realtime data and video and interacting directly with the crew in the field. For part of this campaign we also have a 2nd backroom set up in the Netherlands partnering with the European Space Agency at the European Space Research and Technology Centre. The kinds of data that we have access to in the backroom includes live audio feeds from the crew (delayed 50 seconds because they are on an asteroid), video feeds (also delayed) from each crew member’s backpack as well as several video cameras including a “gigapan” camera on the rover, and more cameras inside and outside the “deep space habitat” or DSH. We have GPS positioning of the rovers and the crew that are displayed in Google Earth. We have geologic maps that were created for the mission from orbital imaging, like they would be in a real mission. And we have all our individual geologic training to rely on. All of these different types of data allows the backroom to follow along with the EVA as though we were in the field. It’s as though each crew member has 9 trained geologists in their pocket as they go about their EVA. In the science backroom, each team member has a specific role and job to do. Some are following a specific crewmember as they make geologic observations and collect samples. One is in charge of cataloging and prioritizing all the samples collected. One is in charge of imaging, keeping track of all the cameras and even operating them when the crew is in the field. We have a “Scicom”, the science equivalent of a “Capcom” that talks directly to the crew, and a science lead that keeps us all organized and coordinates with the flight director. 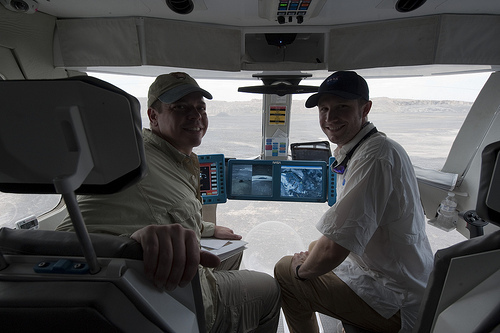 A typical day is about 12 hours long and is hectic and intense because we are keeping track of everything on the ground and observing what the crew is doing on the asteroid, and then on top of that, we are trying to make geologic sense of it all. Despite the long hours, we find it very rewarding to use our skills as scientists to enable meaningful science in the course of human exploration. Image from the science backroom from the European Space Agency in the Netherlands. Image shows Jose doing an Extra-Vehicular Activity (EVA) with the Space Exploration Vehicle in the background. We just finished week 1 of Desert RATS 2011. My crew has spent most of our time working in the Deep Space Habitat (DSH), including a 3-day long stay we just completed yesterday. Our time in the DSH has focused on evaluating the inside volume and configuration of the laboratory and living quarters for a long-duration mission, such as to an asteroid. Living in the DSH has been a fun experience and it is exciting to know that our work and opinions will have a role in shaping future exploration. We begin each morning with a virtual briefing with Houston where we are given our day’s schedule of tasks, including some we can schedule ourselves. 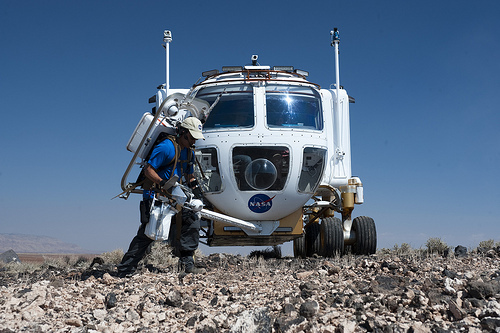 Throughout the day our various tasks can include: exercising; doing education and public outreach events; maintenance and cleaning of the habitat interior; diagnosing and fixing equipment; medical operations; bioscience experiments; and analysis of rock samples collected during EVAs (extravehicular activities, or “spacewalks”) by our Crew B counterparts. I’ve spent most of my time doing the latter using the GeoLab (below). 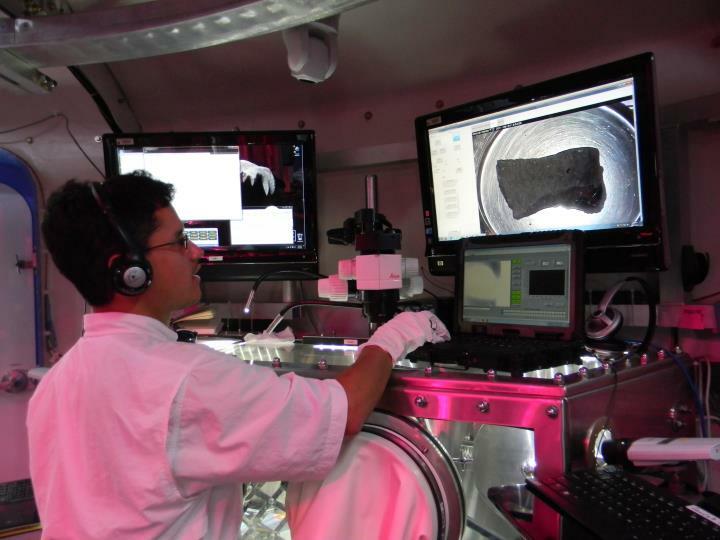 The GeoLab comprises a glovebox in which samples can be handled and studied in a controlled environment. On one end is mini-airlock through which new samples can be passed from the outside and other the other end is another mini-airlock for moving samples out once they have been worked on. In between, are several stations for characterizing geologic materials: a scale; rulers for measuring; a camera for macroscopic images; a microscope for very detailed images; an X-ray fluorescence spectrometer for measuring the chemical composition of rocks; and a multispectral microscopic imager for taking detailed ultraviolet-visibile-infrared photographs of rocks to determine their mineral composition. As I work on a sample, I’m in communication with a support team in Houston who guide me through procedures and who assimilate the data I provide them. It’s been interesting working with the GeoLab because we are collecting real scientific data in a way similar to what we’d do at an asteroid or on the Moon or Mars. I’ve even analyzed several samples that I collected myself on EVAs earlier last week! Life in the DSH during the last few days has also been interesting and fun. My Crew A crewmates (Megan, Kjell, and Jon) and I have shared a spacious upstairs habitat that includes private bunks, a well-stocked galley, exercise equipment, work tables, computer workstations, and even a projector and screen for watching videos. Living in close-quarters where crewmembers have to cooperate and closely interact is something any future long-duration spaceflight will require. Our short stay in the DSH gave us a flavor for how suitable the current configuration is and what improvements could be made. I’m looking forward to the rest of Desert RATS 2011. This week, Crews A and B effectively change places, with Crew A doing several days of EVA operations with the SEVs and Crew B trying out the DSH. Although I enjoyed my time in the DSH, I love doing field geology and working with the rovers, so the next few days will be exciting. I’m also very interested to learn about how Crew B interacts with the DSH. Dr. Jacob Bleacher is a Planetary Geologist working at NASA Goddard Space Flight Center. The 2011 field test is Jake’s third time as a Desert RATS crewmember. In the image to the right, crew members Bob Behnken and Jacob Bleacher from the SEV. One of the big parts to our test this year is trying to understand how to conduct field geology on another planet with a significant time delay between the crew and Houston. 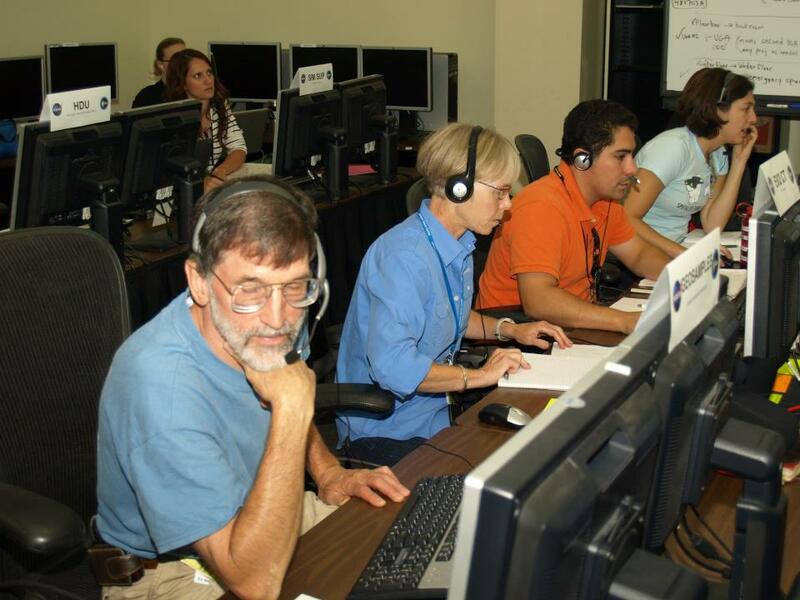 Unlike astronauts who went to the Moon or low Earth orbit, astronauts who explore objects that are farther away will not be able to speak to Houston without a delay between their question and the response. In order to enable our crew to handle this delay we are testing different ways to use 3 and 4 crewmembers between the Deep Space Habitat (DSH), the Space Explorations Vehicles (SEV), and Extra Vehicular Activities (EVA). By placing one crewmember in the DSH, that person has the ability to communicate with Houston by text messages and on communications loops that the EVA crewmembers do not hear. That way the messages that Houston send to the crew do not arrive when the crew are in the middle of an important job, like collecting a crew field note, which might cause them to miss the message. The DSH crewmember is in regular communications with the EVA crew and can receive the messages from Houston and then provide the EVA crew with those bits of information when they are prepared to receive them. Not only are we attempting to understand how to spread the crew between these assets, we are also exploring what are the best positions in which to assign the crew geologists and astronauts. It might seem that the geologist would be best used during an EVA in which they can collect and document the rocks. However, from inside the SEV the geologist can direct their fellow one or two crewmembers who are on EVA. 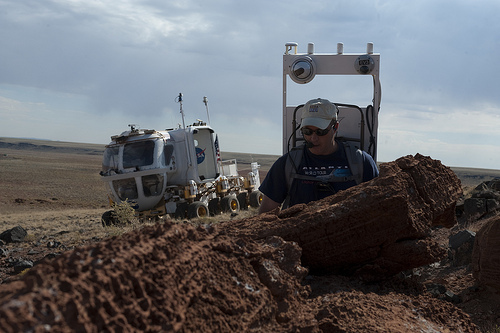 This gives that geologist a better vantage point from which to make connections between the samples that the EVA crew are collecting and the nearby geologic features. This might provide a better overall understanding of the local geology. As you can see, there are many things to consider when assigning your 3 or 4 crewmembers to positions between a habitat, a vehicle, and an EVA. We are only a few days into the test but we are learning many new things that we had not considered beforehand. So stay tuned as the test progresses and you might learn some of these interesting lessons with us. Both Crews Alpha and Bravo have spent several days and nights in the Deep Space Habitat (DSH) to assess how well this habitat can support science, maintenance, and medical operations, as well as the daily life of a crewmember, such as sleep, eating, and simply socializing with your team. Crew Alpha was able to spend 3 nights in the DSH and provided the DSH support team with good feedback. Yesterday I participated in a public outreach event in which I was asked whether or not we practice a possible impact event that could puncture the shell of the DSH. Well, we had a decent chance to go through an unscheduled simulation of such an event. If you are following our test you might have noticed that yesterday we experienced some severe weather that caused us to postpone our test for a full day. Crew Bravo was in the DSH when this severe weather occurred and we experienced a minor breach of the DSH shell. As such this was a perfect chance to assess the situation that I was asked about during my outreach event. The shell leak occurred in the crew quarters when Carolyn and I were conducting our post-sleep activities (eating breakfast, reviewing notes for the day, basically hanging out) in the loft. As soon as we recognized a failure in the DSH outer shell we responded by communicating with our DSH support team to notify them of the event. We also quickly determined where and how severe the leak was and worked to patch that leak as best as we could. The DSH support team was able to provide us with information to assist us with our response to the leak. 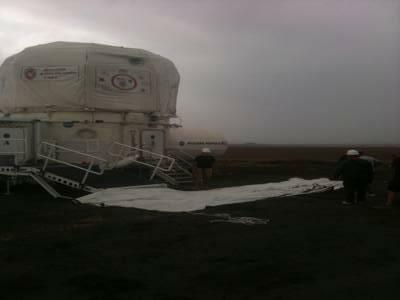 Ultimately, after the day’s test activities had been postponed the support team came to our aid and conducted repairs. This event demonstrates how important it is to maintain awareness of your surroundings during spaceflight, even if you are scheduled for a little rest and relaxation time. You never know when an event like a meteorite impact or system failure could occur, and when working in such a harsh environment as deep space, you must always be ready to respond quickly and effectively. Kudos to our DSH support team and designers for working with us to remedy this unscheduled “simulation” of a shell breach on the DSH.